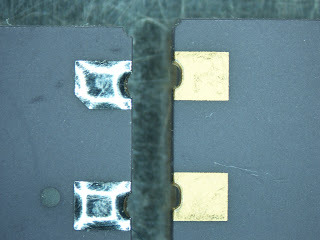 An Aerospace company had a large amount of LGAs with a gold pad finish that they wanted to convert to a lead finish. They wanted the re-tinning to comply with the GEIA standard, the issue was that the components were very small and any standard tooling would not have been able to perform the service on the components. Retronix developed a very cost effective piece of tooling that held the row of the components and allowed them to be processed automatically without causing any issues. The components were then XRF tested to verify compliance and shipped to the customer within 5 days.